A resolution condemning multiple attacks in Damascus on Thursday failed to pass the UN Security Council, and left the US and Russia blaming each other for the impasse. Russian diplomats said the US encourages terrorist attacks by its reluctance to pass the resolution. US and other Western diplomats wanted to include additional language in the text that condemned the Bashar Assad regime’s attacks on civilians. Russia refused. At least 53 people were killed on Thursday when a car bomb exploded near Syria’s ruling Baath party headquarters in the capital. The bomb also caused damage to the nearby Russian Embassy. Elsewhere in the city, two other bombs struck intelligence offices, killing 22, and mortar rounds hit the army’s central command, activists said. “The text [of the draft resolution] confirmed the unshakable principles that terrorism in all its forms and manifestations constitutes one of the most serious threats to international peace and security and has no justification,” said Anton Uspensky, spokesman for Russia’s UN delegation. “Unfortunately, such an indispensable reaction by the Security Council to this terrorist attack has been once again blocked by the US delegation linking it with other questions,” he added. “We consider unacceptable this search for justifications for terrorist actions. It is obvious that by doing so the US delegation encourages those who have been repeatedly targeting American interests, including US diplomatic missions,” he said. US mission spokeswoman Erin Peltin said: “We strongly condemn all indiscriminate terrorist attacks against civilians or against diplomatic facilities. “We agreed with the Russian draft of a statement from the Security Council and only sought to add similar language on the regime’s brutal attacks against the Syrian people. Unfortunately, Russia refused to engage on a credible text,” she added. At least 190 people were killed throughout Syria on Thursday, according to Israel Radio. Recent rebel advances in the Damascus suburbs, combined with the bombings and three straight days of mortar attacks, mark the most sustained challenge of the civil war for control of the seat of President Bashar Assad’s power. Syrian state media said the car bombing near the Baath Party headquarters and the Russian Embassy was a suicide attack that killed 53 civilians and wounded more than 200, with children among the casualties. 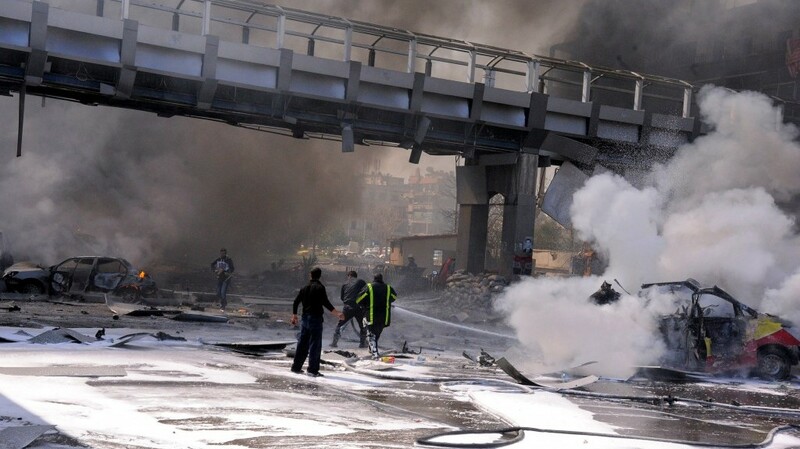 Anti-regime activists put the death toll at 61, which would make it the deadliest Damascus bombing of the revolt. The violence has shattered the sense of normalcy that the Syrian regime has desperately tried to maintain in Damascus, a city that has largely been insulated from the bloodshed and destruction that has left other urban centers in ruins. The rebels launched an offensive on Damascus in July following a stunning bombing on a high-level government crisis meeting that killed four top regime officials, including Assad’s brother-in-law and the defense minister. Following that attack, rebel groups that had established footholds in the suburbs pushed in, battling government forces for more than a week before being routed and swept out. Since then, government warplanes have pounded opposition strongholds on the outskirts, and rebels have managed only small incursions on the city’s southern and eastern sides. But the recent bombings and mortar attacks suggest that instead of trying a major assault, rebel fighters are resorting to guerrilla tactics to loosen Assad’s grip on the heavily fortified capital. The fighting in Damascus also follows a string of tactical victories in recent weeks for the rebels – capturing the nation’s largest hydroelectric dam and overtaking airbases in the northeast – that have contributed to the sense that the opposition may be gaining some momentum. But Damascus is the ultimate prize in the civil war, and many view the battle for the ancient city as the most probable endgame of a conflict that according to UN estimates has killed nearly 70,000 people. To defend the capital, Assad is using his most reliable and loyal troops, activists say, including the Republican Guard and the feared 4th Division, commanded by his brother, Maher. Armed checkpoints have sprung up across the city as part of the regime’s efforts to keep the rebels at bay. Thursday’s car bomb hit a checkpoint on a bustling thoroughfare in the central Mazraa neighborhood between the Baath Party headquarters and the Russian Embassy. The force of the explosion shattered the balconies of apartment blocks along the tree-lined street and blew out the windows and doors of the party building. Video of the blast site on Syrian state TV showed firefighters dousing a flaming car with hoses, while lifeless and dismembered bodies were tossed onto the grass of a nearby park. The state news agency, SANA, published photos showing a large crater in the middle of the rubble-strewn street and charred cars with blackened bodies inside. “It was huge. Everything in the shop turned upside down,” one local resident said. He said three of his employees were injured by flying glass that killed a young girl who was walking by when the blast hit. “I pulled her inside the shop, but she was almost gone. We couldn’t save her. She was hit in the stomach and head,” he said, speaking on condition of anonymity for fear of retribution for talking to foreign media. Ambulances rushed to the scene of the blast, which sent a huge cloud of black smoke billowing into the sky. There was no immediate claim of responsibility for the attack, but suspicion will likely fall upon one of the most extreme of Syria’s myriad rebel factions, Jabhat al-Nusra. The group, which the US has designated to be a terrorist organization, has claimed past bombings on regime targets, including the double suicide blast outside an intelligence building in May that killed 55. Such tactics have galvanized Assad’s supporters and made many other Syrians distrustful of the rebel movement as a whole, most of whose fighters do not use such tactics. The main opposition group, the Syrian National Coalition, condemned Thursday’s bombing without accusing a specific group of carrying it out. It did, however, suggest that the regime allowed foreign terrorist groups to operate in Syria. “The terrorist Assad regime bears the most responsibility for all the crimes that happen in the homeland because it has opened the doors to those with different agendas to enter Syria and harm its stability so it can hide behind this and use it as an excuse to justify its crimes,” the group said in a statement on its Facebook page. UN Secretary-General Ban Ki-moon condemned “the series of bombings in populated areas in the Syrian capital Damascus today, which resulted in numerous deaths and injuries,” and expressed condolences to the families of victims. Russia’s state-owned RIA Novosti news agency quoted a Russian Embassy official as saying its building had been damaged in the blast but no one was hurt. Among those injured by flying glass was Nayef Hawatmeh, the leader of the Democratic Front for the Liberation of Palestine, a radical Damascus-based Palestinian group. He suffered cuts to his hands and face, according to an official at his office, which is about 500 yards from the bomb. Hawatmeh was treated at a hospital and released. In a separate attack, Syrian state TV said mortar shells hit near the Syrian Army General Command but caused no casualties. The report said the building was empty because it was being repaired from a bombing last year. The Observatory said two mortar rounds struck near the building but it did not report casualties. It also said two more shells landed in the upscale Malki neighborhood, causing no damage or casualties. Another blast in the northeastern Barzeh neighborhood killed seven people, a security official said, speaking on condition of anonymity because he was not authorized to brief the media. The Observatory, which relies on a network of activists inside Syria, said three separate car bombs exploded near different security facilities in Barzeh, followed by intense clashes between rebels and regime forces. It said 22 people were killed, 19 of them security officers. State media also reported that security forces in Damascus had arrested a second, would-be suicide bomber driving a car full of explosives near the site of the Mazraa bombing. 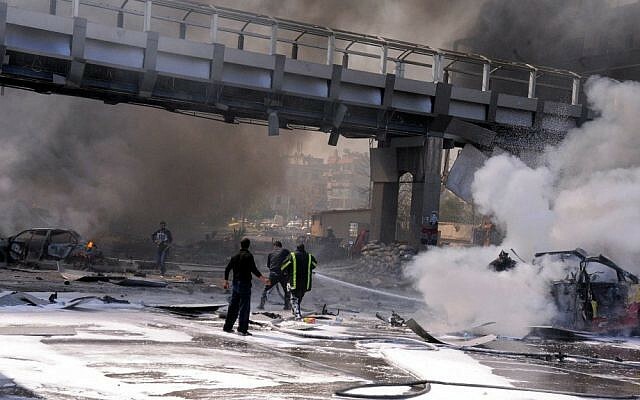 On Wednesday, two mortar shells exploded next to a soccer stadium in Damascus, killing one player. A day earlier, two shells hit near one of Assad’s three palaces in the city, with some damage reported. In the southern town of Daraa, where Syria’s uprising began nearly two years ago, the Observatory said 18 people were killed in an airstrike on a field hospital, included eight rebel fighters, three medics, one woman and a young girl. A video posted online showed the dead and wounded being loaded into the backs of trucks. Some were bloody and had bandaged heads, while others were carried on stretchers. The videos appeared to be authentic and corresponded with Associated Press reports of the events depicted. The conflict began in March 2011 with political protests against the government, and has since evolved into a civil war between Assad’s regime and hundreds of rebel groups seeking to topple it. International diplomacy has failed to slow the fighting. British Foreign Secretary William Hague said Thursday that his message to Assad is “it is time to go,” and that the senseless killing must be brought to an end through a political process. He also urged Assad to respond to a dialogue offer made recently by Syrian opposition chief Mouaz al-Khatib. “A political agreement on a transition is the way forward in Syria to bring to an end this terrible and unacceptable loss of life,” he said. Al-Khatib has said he is open to talks with the regime as a way of removing it from power. The government has refused, insisting the talks should be without preconditions and inside the country. The Syrian National Coalition met in Cairo on Thursday to try to firm up its position on whether to engage with the regime in talks. A final decision was expected Friday.